In which Alice Morse Earle describes how North American colonists made candles, ruminates on bayberry. 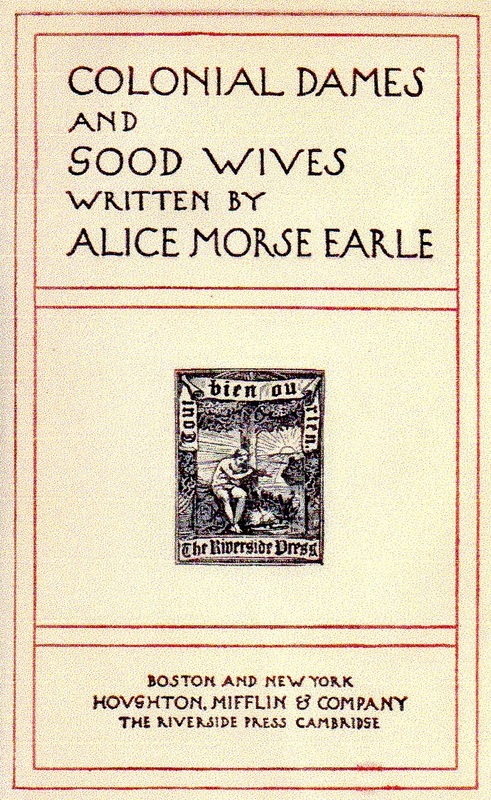 Colonial Dames and Good Wives, by Alice Morse Earle, provided accounts and descriptions of what life was like for English and other European women who had crossed the sea to settle in America during colonial times. 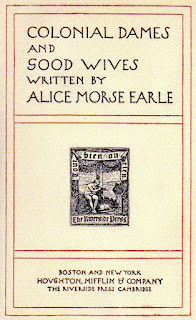 The book was published in 1895; the dozen chapters include titles such as “Women of Affairs,” “Two Colonial Adventuresses,” “The Universal Friend,” “A Revolutionary Housewife.” The following excerpt is from Chapter 12, “Fireside Industries.” Earle has just described soapmaking; now it is time for candlemaking. The dancing firelight shone out on no busier scene than on the grand candle-dipping. It had taken weeks to prepare for this domestic industry, which was the great household event of the late autumn, as soapmaking was of the spring. Tallow had been carefully saved from the domestic animals killed on the farm, the honeyed store of the patient bee had been robbed of wax to furnish materials, and there was still another source of supply. The summer air of the coast of New England still is sweet with one of the freshest, purest plant-perfumes in the world—the scent of bayberry. These dense woody shrubs bear profusely a tiny, spicy, waxcoated berry; and the earliest colonists quickly learned that from this plentiful berry could be obtained an inflammable wax, which would replace and supplement any lack of tallow. The name so universally applied to the plant—candleberry—commemorates its employment for this purpose. I never pass the clumps of bayberry bushes in the early autumn without eagerly picking and crushing the perfumed leaves and berries; and the clean, fresh scent seems to awaken a dim recollection, a hereditary memory, and I see, as in a vision, the sober little children of the Puritans standing in the clear glowing sunlight, and faithfully stripping from the gnarled bushes the waxy candleberries; not only affording through this occupation material assistance to the household supplies, but finding therein health, and I am sure happiness, if they loved the bayberries as I, their descendant, do. A pale green brittle wax of a curious green color, which by refining becomes almost transparent. Of this they made candles which are never greasy to the touch nor melt with lying in the hottest weather; neither does the snuff of these ever offend the smell, like that of a tallow candle; but instead of being disagreeable, if an accident puts a candle out, it yields a pleasant fragrancy to all that are in the room; insomuch that nice people often put them out on purpose to have the incense of the expiring snuff. It is true that the balmy breath of the bayberry is exhaled even on its funeral pyre. A bayberry candle burns like incense; and I always think of its perfume as truly the incense to the household hearth-gods of an old New England home. I am now to beg one favour of you, that you secure for me all the bayberry wax you can possibly lay yor hands on. What charge you shall be at securing it shall be thankfully paid you. You must take a care that they do not putt too much tallow among it, being a custome and cheate they have gott. When the candle-dipping began, a fierce fire was built in the fireplace, and over it was hung the largest house kettle, half filled with water and melted tallow, or wax. Candlerods were brought down from the attic, or pulled out from under the edge of beams, and placed about a foot and a half apart, reaching from chair to chair. Boards were placed underneath to save the spotless floor from greasy drippings. Across these rods were laid, like the rounds of a ladder, shorter sticks or reeds to which the wicks were attached at intervals of a few inches. The wicks of loosely spun cotton or tow were dipped time and time again into the melted tallow, and left to harden between each dipping. Of course, if the end of the kitchen (where stood the rods and hung the wicks) were very cold, the candles grew quickly, since they hardened quickly; but they were then more apt to crack. When they were of proper size, they were cut off, spread in a sunny place in the garret to bleach, and finally stored away in candleboxes. Sometimes the tallow was poured into molds; when, of course, comparatively few candles could be made in a day. In some communities itinerant candle-makers carried molds from house to house, and assisted in the candle manufacture. These candles were placed in candlesticks, or in large rooms were set in rude chandeliers of strips of metal with sockets, called candle-beams. Handsome rooms had sconces, and the kitchen often had a sliding stand by which the candle could be adjusted at a desired height. Snuffers were as indispensable as candlesticks, and were sometimes called snuffing-iron, or snit—a word not in the Century Dictionary—from the old English verb, “snyten,” to blow out. The snuffers lay in a little tray called a snuffer tray, snuffer-dish, snuffer-boat, snuffer-slice, or snuffer-pan. Save-alls, a little wire frame to hold up the last burning end of candle, were another contrivance of our frugal ancestors. In many a country household some oldtime frugalities linger, but the bounteous oil-wells of Pennsylvania have rendered candles not only obsolete, but too costly for country use, and by a turn of fashion they have become comparatively an article of luxury, but still seem to throw an old-time refinement wherever their soft rays shine.